Maryland Motocross - It's time to Recognize. MM: Thank you for taking this opportunity to interview with us Steve, first off, you’re injured care to tell me about it? MM: (Pause) Wow… that’s uh… pretty intense… that’s tough. Timmy, one thing I’ve always wondered about, in reference to feet, do you know why when people go around turns, they stick their feet out? JL: To shift your weight so you get traction on your front wheel. MM: Any favorite tracks or events you look forward to through out the year? MM: No? it doesn’t matter? MM: Hmmm…Any advice to those new to baseball Jimmy? MM: Do you have any advice for people new to baseball? JL: (Not knowing which is more confusing, me asking him about sports or calling him different names) Baseball? MM: Oh, you do baseball too? JL: No… I just thought you said…baseball. MM: No. I’m pretty sure I said motocross. But, uhh…moving on, what kind of bikes do you have? JL: (Seemingly certain that I said baseball, wanting to tell me I did, but being nice about it) Uhhh… 2003 CR 125, 2004 CRX 150, and 2004 250. MM: Well, Mike, Some people mentioned that they were looking forward to racing you and trying to beat you, how does it feel that people are gunning for you? MM: I talked to someone and they told me that you’d be awesome if you worked on your speed, do you concur with this observation? JL: Worked on my whaattt? MM: Worked on your speed? MM: They said you could be a little bit faster...a little bit quicker. Do you agree with them? JL: (Seemingly taken back) Umm…I…uh… I agree with them… I…guess…I could always be… faster. I don’t go to the track thinking I’m the fastest person in the world. MM: Do you think you’re fast? JL: I… guess… I’m kinda fast. MM: Well, I can’t tell you who said it, but their name begins with Kevin Duffy. JL: Hah! KEVIN DUFFY. (says the name like it’s his arch-nemisis) (Scoffs) – I do concur with Kevin Duffy. Anything about MX you don’t like or would like to see change? JL: Not really. Um…It’s been the same for the 10 years I’ve been racing. MM: Ever cased a hill Johnny? MM: Ok. Schnoogins. How long do you think it will be till you do your next gate drop? JL: I’d like to say… 3 1/2 months. MM: So what have you been doing in the meantime since you’re injured? JL: Um…Laying in the house…stuck in the house pretty much. I went to the mall once and that was terrible, cause it took too long to get around. My girlfriend…she helps me out a lot…doing everything for me so I can just be lazy. MM: Must be nice…Tell me Bill, You ever seen Captain M race? JL: Captain M? I don’t know who Captain M is. I saw him on Duffnstuffracing.com, but I don’t know who he is. MM: You’ve never met him in person? MM: Interesting. So, I know your girlfriend is very supportive, are your friends and family supportive of your racing? JL: Yeah, I think everyone I know is. MM: Well, thank you for your time and we’ll look forward to your return soon. 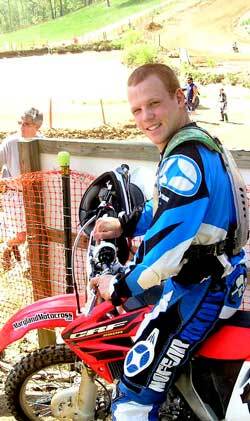 Everybody at Maryland Motocross wish James a speedy recovery, Get Well Soon !